Denise Hildreth Jones' latest novel, "Secrets over Sweet Tea," (you can read my review here) is the companion to her latest non-fiction book, "Reclaiming Your Heart: a journey back to laughing, loving, and living." Both of these books will really make you think about your own lives, where you have been, where you are going and changes you would like to and need to make in your own lives. 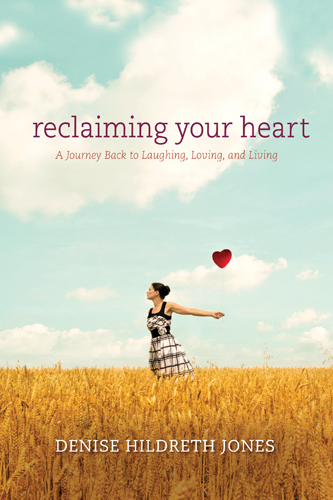 "Reclaiming Your Heart" really focuses on our heart - such a vital part of our bodies and life, including our interactions with others and how we each feel about ourselves. Denise really opens up and shares her own heart - her moments of hurting, her moments of feeling like giving up, her moments of just going through the motions instead of savoring the moments and enjoying life. Each chapter is filled with Denise's thoughts, personal experiences and stories from the Bible as well. Most of the chapters focus on a certain "type" of heart, for example there is a chapter focusing on the angry heart, the critical heart, the weary heart and the shamed heart to name a few. To help the reader go more in-depth and get even more blessings from this book, there is a 10-week study that can be downloaded at www.reclaiminghearts.com. Reading through this book is like sitting down with Denise chatting over coffee (or sweet tea!). Denise shares her heart as if she is talking with a close girlfriend and is seeking to share and help all at the same time. I highly recommend both this book and the companion novel for every woman to read as both are enjoyable and uplifting. I am looking forward to rereading this book and working through the 10-week study as well. Find out how a mysterious gift forever changed author James Michener's life in The Christmas Present. Experience a truly powerful life-changing moment in Christopher Reeve's Decision. Let actor George Burns make you feel like you're dancing on air in Shall We Dance? Find encouragement and hope in Dwight Eisenhower's essay: An Open Letter to America's Students. Go looking for true peace and happiness as Barbara Walters takes you In Search of Heaven. Get ready to see the whole world anew as Helen Keller imagines what it'd be like to only have Three Days to See. Marvel at the healing power of laughter in Billy Crystal's amazing true story: My Father and Me. Organized around timeless American values -- joy, miracles, giving, gratitude, holidays and healing -- readers will laugh, cry, cheer, sigh and renew their faith as they enjoy the powerful impact of a well-told story. RDA is a global media and direct marketing company that educates, entertains and connects more than 130 million consumers around the world with products and services from trusted brands. With offices in 43 countries, the company reaches customers in 78 countries, publishes 91 magazines, including 50 editions of Reader's Digest, the world's largest-circulation magazine, operates 78 branded websites and sells 40 million books, music and video products across the world each year. Further information about the company can be found at www.rda.com. This collection of stories from the Reader's Digest is some of their most moving stories that have been published over the past 90 years. The stories are divided into seven sections/categories which are: joy, miracles, gratitude, giving, holidays, healing, and heroes. This feature makes it easy to sit down, pick up the book and pick out a story that you need or want to read at the moment. Although, I found myself reading several stories at a time as they are all so good and I was pulled into one story and then wanted to keep on reading more! If you enjoy reading the Reader's Digest, then this collection is a must-have for you! Denise Hildreth Jones' latest novel, "Secrets Over Sweet Tea," is a must-read for women as it is such an accurate portrayal of women and the many fronts that we may put on in order to mask our true feelings and hurting. Scarlett Jo is not your typical pastor's wife as she is loud, wears bright clothes that others point out she shouldn't be wearing at her age and speaks her mind (although she is working on knowing when not to speak!). Scarlett Jo takes a walk every morning and prays and sings. She is a people watcher and prays for her neighbors and tries to help them in any way that she can. Grace and her husband Tyler move to the street and Scarlett Jo reaches out to Grace and welcomes her to the neighborhood. As the lives of these two women intersect secrets are spilled, their friendship is strengthened and lives are changed. Scarlett Jo is such a wonderful and fun character to spend time with. I would love a friend like her! Grace is a character whom tugged at my heart so much throughout the book. She is so successful professionally, yet there is so much hurting and heartache in her personal life as her husband Tyler has turned to alcohol. I love the setting of the book as well and the bits of Southern culture mixed in. This is a wonderful book and one that I will share with others and reread several times. 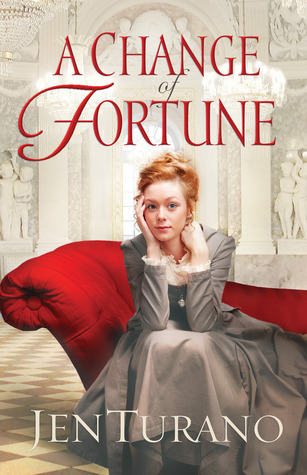 "A Change of Fortune" is Jen Turano's debut novel and I cannot wait to read many more by her! I started this book and had it finished within 24 hours, it was so good I did not want to stop reading! Lady Eliza is masquerading as a governess in New York City after traveling from London in search of a man and woman who have destroyed her father's reputation and stolen the family's money. However, Eliza has one mishap over another including ripping her dress at a dinner party, getting trailed by the older sister of her charges and landing them both into jail and then being dismissed from her job to being taken in by a man whom she is attracted to and shares a common enemy ywith. Eliza is not in search of a husband, but as she spends more time with Hamilton she cannot fight her feelings. However, as Hamilton gets to know Eliza better, he develops feelings for her, but also feels that he cannot compete with her former lifestyle. As Hamilton, Zayne, Agatha and Eliza all work together to seek justice and find answers, Hamilton's children are placed in danger and Eliza learns what really matters most. I was immediately drawn into the story and into Eliza's life! I absolutely loved every word of this book! It had me laughing out loud as the various mishaps the characters had, and it had me wondering what would happen next during their many adventures. I loved the characters and the dialouge between the characters - that is probably what I loved most about this book! This is an incredible debut novel as it captivated me right from the start to the very end, the time period and the characters came alive and it was just so well-written and enjoyable to read! I am hoping her next book may be about the same characters as I would love to know what happens with Agatha and Zayne, Grayson's story and how Ming became his daughter, as well as spend more time with Gloria, Theodore, and the entire Watson family, and of course Hamilton, Eliza, Piper and Ben! I am highly recommending this book - you will not be disappointed! Ann Shorey's book 2 of her Sisters at Heart series, "When the Heart Heals," is such a great addition to the series and tells Rosemary's continued struggle to fit in and ultimately find her happily ever after. Rosemary is happy living on her own, growing her herbs, and spending time with her brother and sister-in- law, Curt and Faith. Rosemary is still struggling to be accepted in the town and wants to prove that it is acceptable for women to be nurses. When Rosemary is hired by the new doctor, Elijah, to be his nurse, Rosemary is thrilled for the opportunity to do what she loves and be able to support herself at the same time. However, when the threats that Rosemary receives become more and more dangerous, she is forced to make some changes in her life. As Rosemary and Elijah's relationship becomes personal as well as professional, Rosemary must follow her head and her heart, but will she have the courage to listen, face adversity and take some chances? This is such a wonderful series so far and I am looking forward to book 3, guessing it may be Cassie's story as she has played a role in both of the first two books and has not found her "happily ever after" yet. There are so many stories going on at once in this book and I fell in love with the returning characters once again and with new ones, including Jolene and Galen as well as Rosemary and Curt's parents. This is an excellent story of healing and love! 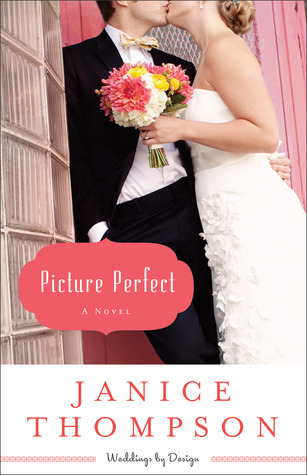 "Picture Perfect" is the excellent start to Janice Thompson's new Weddings by Design series. I loved her Weddings by Bella series and her Backstage Pass series and was thrilled that characters from both series are included in this new one! Hannah is trying to be in the top spot on Bella's list of recommended photographers for her wedding clients. This is not easy as it seems that her competition, Drew, is everyone she is and also vying for the same position. When Hannah is dealing with a bride and the bride's unreasonable manager, Hannah realizes that Drew may not be the competition after all, but someone she can partner with. As Hannah and Drew spend more time together, Hannah realizes that her heart is getting involved and she may have had the wrong perspective on Drew, on her business and on her priorities this whole time. I loved this book! This is another winner from Janice Thompson and I cannot wait to read the next one as soon as it is out! I love Bella's entire family and their gatherings and Hannah's family is just another great addition to the whole clan! There is so much tied into this book - the interactions between the families and family members, the side stories of various characters including little bits about the main characters from her other series, and the references to popular reality shows that tie in so well. The characters are all so real in this book, they could seriously be the family next door and I found myself getting excited and nervous right along with them. I think what I love the most about these books are the family gatherings and togetherness, the blending of cultures and traditions - both old and new ones that are created. I am looking forward to book 2 and Scarlet's story! "Rebekah," book 2 in Jill Eileen Smith's Wives of the Patriarchs series, is a must-read for historcial fiction and/or Biblical fiction readers! Rebekah comes to live in this book as her story is shared - the heartache, betrayal, hope and love that she fights for. Rebekah's father has passed away leaving her in the care of her brother Laban. Rebekah has hope for moving on and for love when she gets the chance to marry Isaac. This book takes us on this journey with not only Rebekah but also Isaac and Abraham as well. I have heard this story and read it several times in my Bible; however after reading this book I have a whole new perspective on the characters especially Rebekah and am excited to go back and read the Biblical account once again. Jill's style of writing is so easy to read and I always get pulled right into the story and the characters lives and stay there until the very last page. Enter Today - 2/11 - 3/5! Celebrate the release of Unbreakable with Nancy Mehl by entering her Kindle Fire Giveaway and RSVPing to the March 5th Author Chat Party on Facebook! Despite the attempts of Hope and other Kingdom residents to maintain the status quo, changes have already begun to stir in the small Mennonite town. The handsome and charismatic Jonathon Wiese is the leader of the move to reform, while Ebbie insists Kingdom must remain true to its foundation. When Hope’s safety is threatened by a mysterious outsider, she can’t help but question what she’s always been taught about the Mennonite tradition of nonviolence. Nancy Mehl is one of my new favortie authors! Her book, "Unbreakable," is the second in her Road to Kingdom series and I am hoping that the third will be out soon! You will want to be sure to read book 1, "Inescapable," as the characters are the same in both books and it is another excellent book! Hope has always obeyed the rules and traditions in Kingdom, but changes are taking place and Hope is not sure where she stands on some of the issues. After Hope is threatened and then her life is saved she is having second thoughts about many of her beliefs and also her engagement to a man in Kingdom as she has feelings toward a newcomer to their town. As Hope tries to sort out her feelings for both of the men, run the quilt shop and spend time with her friend Lizzie and her family, Hope feels more confused and unsure of where to stand. You will not want to miss out on this story that brings you into this Mennonite community and the characters' lives so that you feel as if you are one of them! You will be kept guessing until the very end as to whom Lizzie chooses - Jonathon or Ebbie. Two organizing experts, Sandra Felton (The Organizer Lady) and Marsha Sims (Sort-it-out, inc.), have teamed together to write their book, "5 Days to a Clutter-Free House: Quick, Easy Ways to Clear Up Your Space." I have to be honest that I was so excited to read this book, as I feel like I always have something to clean and organize around the house and cannot keep up with everything! This book is split into two sections. the first focuses on getting the home/the items all under control and organized and the second section is how to keep the home organized and managing time and all areas of one's life. Much of this first part of the book focuses on making a plan, forming a team to help you tackle the home stages at a time and tips for making the plan successful in the follow-through. A main point and question that is asked in the second section is if your home were perfect what would it look like/be like? That is so important to address as each person's idea of perfection and the ideal home is different. There are clutter-buster tips included and also tips for really individualizing this plan. I like the layout of this book as it is easy to use and filled with excellent tips and encouragers to really help get the home organized in order to live confortably. While I would not go through with all parts of the plan that are included as I personally do not like them or feel they would work for me just as they are, I find so many parts of the book extremely useful and practical. One tip to help maintain an organized home is to avoid over-shopping. If you see something you want, take a picture and wait for twenty-four hours to see if you still want it; if you do, then you go and buy it. Excellent, easy tip to implement and this is just one of many in this book! "A New Home for Lily," is book two in Mary Ann Kinsinger and Suzanne Woods Fisher's The Adventures of Lily Lapp series. Lily and her family have moved to a new home and there is nothing that she likes in the home besides the working light switches, but that will only be for a few weeks. Lily is in a new home, has to go to new school, does not even have her own real bedroom and has to make new friends. Lily finds out that her new home and her new community is filled with new adventures and fun, exciting things for her to do. This is a really fun book for kids to read. Young girls will enjoy reading about Lily and her many adventures with her brothers and friends. The story includes details about everyday farm life as well as fun things such as going sledding and exploring new places. Lily's feelings are also expressed and girls will be able to relate to Lily and decide how they would react in the same situations and feel. I highly recommend this book and series for young girls to read. I am looking forward to more books in this series! I really enjoyed Katie Ganshert's novel, "Wildflowers from Winter," and I was thrilled to see that she had another novel released! 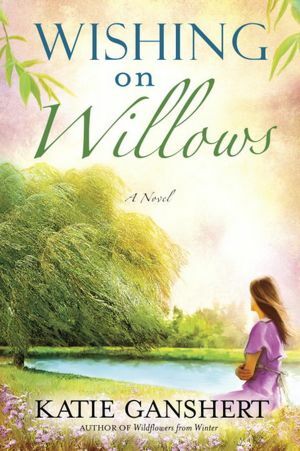 "Wishing on Willows" transports the reader back to Iowa and back into the lives of characters whom we all fell in love with in the first book! Robin is struggling to keep her cafe open and care for her son as a single mom. This cafe means more to her than people on the outside know. Ian is struggling to save his father's business and do something good, however it will destroy Robin's cafe. Both Robin and Ian are trying to do things with a purpose, but yet it does not seem to be a win-win situation. I do not want to share too much about the story as I want you to go pick up a copy and read it, you will not be disappointed! I love the cafe setting and the relationships between the characters. This is an excellent book filled with characters whom come alive on the pages drawing you into their story.